Disney has released the first poster and teaser for its upcoming adaptation of Artemis Fowl based on the novel by Eoin Colfer. Hot on the heels of the release of the first teaser for the live-action version of The Lion King, Disney has now revealed the first glimpse into the magical world of Artemis Fowl. The film stars new-comer Ferdia Shaw as the titular character, Lara McDonnell as elf Captain Holly Short, Tamara Smart as Juliet Butler, Nonzo Anozie as Domovoi Butler, with Josh Gad as the dwarf Mulch Diggums, and Judi Dench. In the trailer, we hear the narration of Judi Dench who, according to Digital Spy, plays Commander Root, the leader of the reconnaissance division of fairy police force LEPrecon, a gender-swapped role from the original book series. Judy Hofflund and Kenneth Branagh are producing with Angus More Gordon and Matthew Jenkins serving as executive producers. The screenplay is by Conor McPherson. Branagh previously directed Disney’s live-action adaptation of Cinderella starring Lily James and Richard Madden. 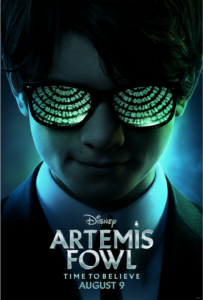 Don’t miss Disney’s Artemis Fowl when it opens in theaters on August 9, 2019.